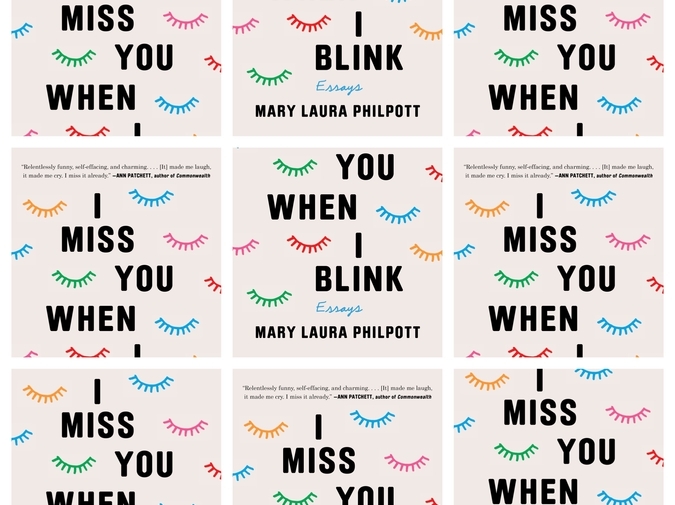 When I first read Mary Laura Philpott's memoir, I Miss You When I Blink, which released April 2nd from Atria Books, it was the night before my wedding to my wife. Philpott's words soothed me as I sat in bed, listening to the distant traffic outside my window, only distracted by the anxiety in my chest—I wanted this more than anything, and yet, I was terrified. Reading Philpott's memoir soothed me in the only way I know how to self-soothe, through shared experiences and the feeling of "me too." Her essays in the book, titled by her son (more on that below), accurately describe how so often you can seem like you have everything in life and still, more often than not, feel at a loss. This book works as a connector—a passageway between isolation (me, myself, and I) and the universal "we." That's what we all want at the end of the day, to not feel so alone, and I think Philpott's success is easier felt than told. Read her book the night before a life changing moment (or a Monday) and walk into the day with your head held high. Mary Laura Philpott answered my questions via email. I really enjoyed reading about her experiences working through her own book, the origins of the title, and her perspective as a bookseller turned writer. Haley Sherif: You titled your book I Miss You When I Blink, words as you pointed out in the first essay, that actually came from your son. At what point did you know you wanted to use his phrase as your title? Why did you feel such a powerful resonation with the title? Does your son remember saying those words to you? What does he think of being the author of the title of your book? Mary Laura Philpott: The wonderful thing about teenagers — which is what he is now — is that they are very focused on their own lives and not the least bit interested in what their parents are up to. So, while he does know (and feels vaguely proud?) that I’ve used his words as a book title, I’m not sure it’s up there on his list of things to think about. As for why I love the phrase so much: It has so many facets. “I miss you when I blink” sounds a little like nonsense at first, but if you sit with it for a while, you can start to see different shades of meaning in it. Loneliness, solitude, love, absurdity, personal evolution… it’s all in there. That’s why the very first essay in the book tells the story of that phrase and how it not only became important to me personally but also grew to represent my understanding of how all of us human beings relate to each other and to the past and future iterations of ourselves. Plus it’s fun to say, “I miss you when I blink,” isn’t it? HS: You work at Parnassus Books in Nashville. As a bookseller, and now a second-time author, has your relationship to books changed? How about the importance of bookstores for both the reader and the writer? MLP: God bless the indie bookstore. My job at Parnassus is running our digital magazine Musing (https://parnassusmusing.net/), which means I do a good bit of the reading/writing/publishing work from home, but I also drift in and out of the store to spend time around booksellers and readers. It never stops blowing me away how intelligently and attentively booksellers work to match people up with books they’re going to love. It’s tremendously comforting to think, as a writer, that all over the country there are these enthusiastic, knowledgable human beings helping books find their way into the hands of the people who need to read them. HS: Ann Patchett writes this about your book: "In her willingness to tell her own story, she taps into a universal truth for so many women: we plan to do it all until we find we can’t do anything anymore.” When was the very first moment you felt an "eternal dread” (as you call it), that this was not the life you wanted to continue to live? What feelings came with that realization? What actions? MLP: These questions certainly get at what I Miss You When I Blink is about. As I share in the book, the realization that I’d built a daily existence I didn’t really love anymore came over me in waves. And for a long time, I thought it meant something was wrong with me — that I was failing to thrive in a situation where I had everything going for me. But once I was able to get away from that daily routine a bit and shake free of some habits that weren’t working for me, I could see opportunities to change how I was living. A huge part of that for me was interacting with other people in other places outside my usual environment — and reading other people’s stories, too. During the hardest parts of writing I Miss You When I Blink, one of the things that kept me going was believing this book could do that for someone else. HS: When I was reading your memoir, the theme of loss continued to hit me—the loss of self, the loss of the “right way,” the loss of a life you thought you had been living, maybe not perfectly, but pretty well. From the outside though, your life, like many others, seemed good. Did you run into any big hurdles communicating your insides when your outsides failed to reflect them? Were other people critical of what you were saying and/or doing? How did you deal with that? How do you? MLP: Oh, for sure. When your outside doesn’t match your inside, you feel lonely, right? You’re alone with your true self. I don’t know that I’ve ever gotten my outside to match up 100% with my inside, and I’d venture to say very few people truly do. There’s a self-protective function to keeping some things just for yourself, on the inside. But yes, it’s very hard to say to loved ones, “I know I look fine, but I’m actually not happy.” And that’s part of what I explore in this book. I felt really worried about what people would say — partially because I didn’t want to be judged, of course, but even more because I didn’t want to hurt anyone. I was afraid that saying to my friends, “I love our friendship, and I want to keep it, but also I need to move away to a place where I can be happier in my daily existence,” would come across as, “I don’t love our friendship enough to stay living here near you.” There was no perfect way around or through those conversations. HS: I found this quote to be particularly poignant : “Maybe we all walk around assuming everyone is interpreting the world the same way we are, and being surprised when they aren’t, and that’s the loneliness and confusion of the human experience in a nutshell…” Loneliness—for me, and perhaps others—is such an isolating feeling. The ironic part being, we look at others as perhaps having "the solution" and more often than not they look at us wondering if we do. How do we reconcile that? How do we fight through the loneliness, so we know we are not so alone? MLP: Sharing stories with each other helps. And if you’re not the kind of extroverted person who goes around swapping personal stories out loud with other people, reading helps a lot, too. As I’ve said, that’s part of what drove me to finish this book. It’s amazing how much relief you can get just from realizing that lots of other people are experiencing the same things you are. Even if it doesn’t alleviate the feeling itself — stress or worry or sadness or whatever — that connection at least assures you that you’re not the only crazy alien feeling the way you feel. And if you can possibly find stories that not only make you feel less alone but also make you laugh a little? That’s priceless. A good, hard, snorting-out-loud laugh can get you through a lot. HS: As a writer, do you ever grapple with writing for the reader vs. writing what you need to write? I know I often times feel stuck between saying what I need to say, but also wanting to make sure my truths can be felt and heard universally. Back to that loneliness you speak so accurately of. MLP: It’s a tricky balance, indeed. Maybe that’s the difference multiple drafts make? At first, you’re just writing what you need to write. Then you go back and figure out which parts of that mess are worth polishing up for other people to read. At a certain point, if your goal is to publish what you’re writing, you do have to address the question of whether it can sell or be received by other people. The trick is not asking those questions too early, such that they warp or stifle your writing. HS: What would you say to someone who is at the beginning of your journey? Does it ever end? MLP: It’s delightfully freeing to accept that no matter what goals and deadlines you set for yourself, there is no finish line, not really. It’s not like you have to become the fully-cooked version of yourself by age 25 or 30 or 40 and then stay that way. You can pause to rest or to dwell in a particular phase whenever you want, but you can also switch things up whenever you decide to change. Haley Sherif is a writer living in Boston with her wife and dog. When she's not writing, she workd in retail and loves the interactions she gets to have on a daily basis. Her work has recently been published on The Rumpus and in Gravel's March issue.